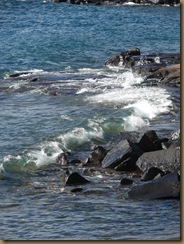 I spent a couple days by Lake Superior this week. I took a lot of pictures trying to capture a little what the lake is to me. It’s hard to explain what it is that gets my complete attention at any moment or during any activity. I’d find myself standing in the middle of the room just gazing through the window watching the waves crashing the rocks…just the movement and color, maybe. Another part of the fascination is the fact that the lake is too big to just take a canoe and cross. This lake is for ships (ore boats and grain carriers). It’s deep and cold and capable of sinking ships in a storm. That’s a bit intimidating. So I settle for pictures and gazings and thanking God who created something that helps me think of His greatness and powers. 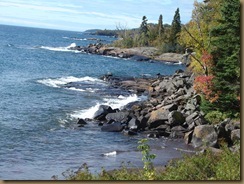 I've had sort of a soft spot in my heart for Lake Superior every since our family went up the north shore for vacations when I was a kid. Coming as we did from dry and empty western South Dakota, you can imagine how impressive the big lake was. It's the coldest of the Great Lakes. I love it too.